As the name suggests, Acer palmatum ‘Coonara Pygmy’ is a dwarf Japanese maple. 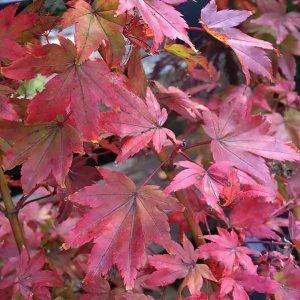 This is a variety that will naturally reach around 2 metres in height, and this makes it one of the better Japanese Maples to grow in pots. It is not only the low growing nature of the plant that is an attraction. The foliage presents a bit of a kaleidoscope of colour. Emerging a pale pink with green overtones in spring, by summer it is a good mid green. As autumn comes around the colour changes yet again to red and orange with a little yellow some times. Like all autumn foliage, the final colour depends a little on the climate. Acer palmatum ‘Coonara Pygmy’ is an excellent garden specimen, best grown in a position where it gets good morning sun and some protection from the heat of the afternoon. This is a favourite plant for bonsai enthusiasts. Excellent as a feature plant in a part shaded border. Also suited to growing in containers in a shady courtyard. Acer palmatum ‘Coonara Pygmy’ is also used as a bonsai starter. Try underplanting with an ornamental grass. Liriope mascari ‘Emerald Cascade’ planted near the drip line is excellent. Mondo grass and Japanese Temple grass are other alternatives. Once planted Acer palmatum ‘Coonara Pygmy’ requires little extra care. Try digging in some well rotted compost before planting. Mulch around the plant to maintain a cool root run, and watering regularly through the first summers. Fertilise using a general purpose organic fertiliser in early spring. Height – Will reach around 2 metres in height. Width – Will spread to around 1.5 metres. Position – Full sun with afternoon shade. Soil – Humus rich and well drained, some moisture in summer is best. Fertiliser – Use a slow release organic fertiliser in spring. Container growing – Yes this variety is suited to growing in pots.